This is the fourth collection of Father Brown stories featuring the ingenious amateur detective. 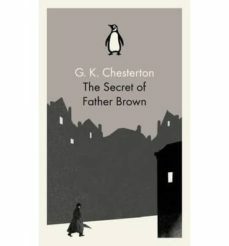 Ahead of a new series of the popular BBC adaptation starring Mark Williams, all five of Chesterton's original Father Brown books have been republished with charming and collectible Penguin covers. 'You see, I had murdered them all myself...I had thought out exactly how a thing like that could be done, and in what style or state of mind a man could really do it. And when I was quite sure that I felt exactly like the murderer myself, of course I knew who he was.' Unassuming super-sleuth Father Brown has such brilliant powers of deduction that he knows more about crime than the criminals themselves. In this fourth volume of stories, the shabby priest unravels the most baffling conundrums involving, among others, a flying fish, a man with two beards and the Worst Crime in the World. G. K. Chesterton was born in 1874. He attended the Slade School of Art, where he appears to have suffered a nervous breakdown, before turning his hand to journalism. A prolific writer throughout his life, his best- known books include The Napoleon of Notting Hill (1904), The Man Who Knew Too Much (1922), The Man Who Was Thursday (1908) and the Father Brown stories. Chesterton converted to Roman Catholicism in 1922 and died in 1938. "Chesterton knew how to make the most of a detective story". (Jorge Luis Borges).